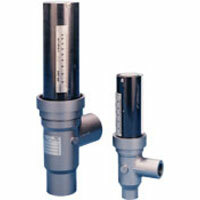 In-line flowmeters are indicators for flow rate. 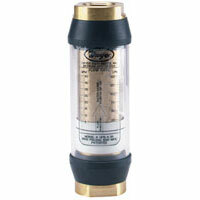 Dwyer's flow meters are ideal for measurement of a range of compatible gases, oil, or water based liquids. Applications include deionized water flow, pickling, compressed gases, harsh environments, coolant lines, and industrial applications. In-Line Flow Monitors are ideal for direct measurement for a range of compatible gases, oil, or water based liquids. Applications include pulp and paper and heating loop flow. 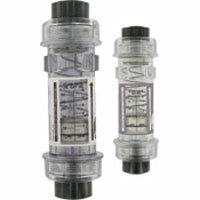 Plastic Flowmeters are a series of clear body, inline flowmeters. They have dual scales measuring both in GPM and LPM. A few applications include chemical processing and hydraulic flow. 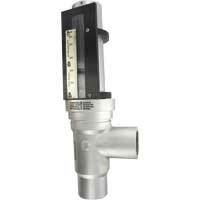 All Metal Flowmeters are industrial flowmeters with a direct reading scale. A few applications include compressed gases, coolant lines, and harsh environments. 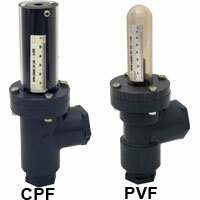 PVC and CPVC Flowmeters are heavy bodied meters for corrosives and high purity fluids. A few applications include deionized water flow, pickling, and electrogalvanization. Total View Industrial Flowmeters are economical, tough, simple, and accurate. A few applications include coolant lines and compressed gases. Stainless Steel Flowmeters are heavy duty, industrial flowmeters with high temperature and pressure limits. A few applications include monitoring steam flow and harsh environments.